新年最值得一玩的手機遊戲在這裏！ 輕鬆又策略，放置且休閒 休閒放置的指尖策略RPG！ 在這裡，四海八荒的神仙都聽命與你喔馬上開啟你的仙界奇遇！ 二郎神會不會鬥雞眼？孫悟空的火眼金睛會近視嗎？玉皇大帝難道是妻管嚴？ 想知道這些答案嗎？我麼你這裡應有盡有哦?不過千萬不要忘了自己的使命你可是天界派來尋找三界神器！混元乾坤鼎的使者當然，茫茫三界廣闊天地，獨自一人尋找實在太過乏味且困難，所謂仙緣所致，在你尋找的道路上將會結識無數仙友，他們既是朋友也是立功的競爭對手哦！此外，什麼嫦娥啊，紫霞仙子啊！這些女神級的人物也都有機會收入囊中哦！嘿嘿嘿！不要光想啦！加入我們，開啟你的三界之旅吧！ ======特色玩法====== 1.經營神廟：特殊系統讓你感受不一樣的卡牌遊戲2.煉丹爐：煉丹爐裡可不是給你放猴子的！ 3.炫寵坐騎：各種神獸想騎啥騎啥 4.萬仙大會：來和你的仙友切磋吧！5.神兵天將：三界奇人異事神仙妖魔美眉靜候你的到來 6.討伐凶獸：集合眾仙之力消滅三界凶獸 Contact us:記得加入fanpage找漂亮的神仙小姊姊領取驚喜福利噢 元寶召喚令升級寶物進階道具一應俱全《西遊記後傳－掛機版》官方Facebook粉絲頁：https://www.facebook.com/西遊記後傳掛機版-1721550594553296/======劇情介紹====== “打了勝仗，卻把我派來當個小土地，哎”作為經歷神魔大戰，並立下不小功勞的前御前侍衛的你，一邊嘆氣一邊在神廟裡聆聽百信的苦難，揮袖施法，替他們一一解憂。想來大戰之後也過了數百年的和平生活，縱然悠哉也多少有些乏味正這麼想著，天界忽然發來指令： 玄能改名不氪也能脫離非洲！俏皮的神仙姐姐給你上的BUFF啦！來這裡！每天都能十連抽 驚喜不斷，讓你感受到世界的善意！ 神仙遊戲！期待您的到來！?有壓力才有動力，你雖然是個神仙，但也同樣適用。過了幾百年的平靜日子，作為三界大戰中天界戰功赫赫的功臣，在天上呆久了未免有些無? ?聊，於是下到凡間考察一番民間疾苦，以凡間神廟為家，也是悠哉遊哉。不料天界一日急報，天界至寶 -混元乾坤鼎在被人偷襲中擊成碎片，散落人間，你恰好在凡間神遊，尋找碎片的重任自然落在你的肩上，別楞著了，快動手幹活了。題材非常新穎的回合制的卡牌遊戲，與神仙、大魔王結合得很有創意，戰鬥特效也好炫！創新的玩法設計，精美的畫面表現，誠意十足的福利發放，回合制的卡牌遊戲玩起來真的好爽好有趣！ ======獨創萌坐騎======龍行天下夥伴隨，伴隨星使飛天遁地萌萌達的外型、伴隨著天使們飛天遁地、上山下海，拯救人間。天梯系統，排行榜，卡牌進化系統，每日登入獎勵，每日任務，卡牌強化系統，好友系統，聊天系統通通都在這裏！New Year most worth playing mobile games are here! Easy andstrategy, placement and recreation Leisure placing fingertipsstrategy RPG! Here, the whole world of gods are glorious and youtake orders Oh Once upon immediately open your adventure! Erlangwill not be cross-eyed? Monkey King will myopic eyes do? Is JadeEmperor henpecked? Want to know the answer? Oh, I can not you allhere? But do not forget their mission, but you sent to find threerealms of heaven artifact! BI universe Ding messenger, of course,the vast realms vast world, looking alone is too boring anddifficult, due to the so-called Xian Yuan, on the road you willfind countless fairy to get to know, they are both Friends alsomeritorious competitors Oh! Also, what Chang E ah, Zijin fairy ah!The goddess-class people also have the opportunity in the bag Oh!Hey hey hey! Do not just think it! Join us and open your realmsjourney! ====== ====== characteristics of play 1. Business temple:a special system allows you to not feel the same card game 2.furnace alchemy: alchemy furnace is not to put your monkey! 3. Hyunpet horse: a variety of animal wants to ride to ride Sha Sha 4. WanSin Assembly: to your fairy learn it! 5. The magic day: Odditiesimmortal demon realms crush await your arrival 6. crusade againstevil beasts: a collection of the immortal realms of force todestroy evil beasts Contact us: Remember to join fanpage findbeautiful little fairy sister receive welfare Oh surprise Advancedupgrade treasure ingot call so readily available props "Journey tothe West after the transfer - Goodbye Edition" official Facebookfan page: https://www.facebook.com/ Journey to the West after thetransfer hook version -1,721,550,594,553,296 / ====== ======Synopsis "Won the battle, yet when I sent a little land, hey." AsShenmodazhan experience, and has achieved no small credit to theformer imperial bodyguard of you, while sighing while listening toa hundred letters in a temple misery, Huixiu magic, grief for themone by one. After World War II also had wanted to live in peace forhundreds of years, even leisurely but also somewhat boring was sothinking, heaven suddenly sent instructions: Hyun can not berenamed krypton also from Africa! Playful fairy sister BUFF on toyour friends! come here! Ten even able to smoke every dayConstantly surprises, you feel the goodwill of the world! Fairygames! Looking forward to your arrival! ? There is pressure to havepower, although you are a god, but is also applicable. After aquiet day for hundreds of years, as the Three Realms war herotransit industry exploits hehe, spent a long time in the skysomewhat ?? no talk, then down to visit some mortal sufferings ofthe people, the temple is home to the mortal world, is prettylaidback. Unexpectedly, the 1st telegraph heaven, heaven treasure -Ding in the BI universe was hit attack in pieces, scattered world,you happen to be in mortal fugue, look for the important task ofdebris naturally fall on your shoulders, do not be shocked with afast hands to work. 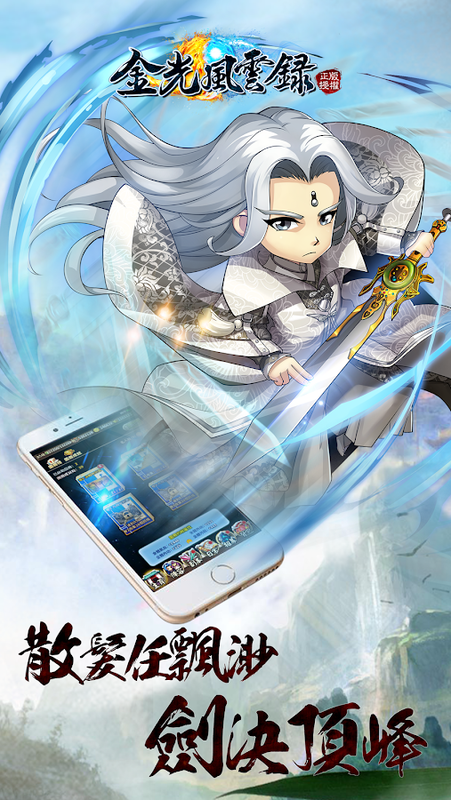 Theme very innovative turn-based card game, andthe gods, big devil in conjunction with a very creative,battle-hyun Ye special effects! Innovative play design, exquisitescreen performance, good faith payment of welfare, turn-based cardgame to play together really thrilled good fun! ====== ======original Meng mounts Dragon world with partners, along with thestar fly or appearance of Meng Meng, accompanied by angels fly ormountains to the sea, to save the world. Ladder system,leaderboards, cards evolutionary systems, daily login rewards,daily tasks, cards to strengthen the system, buddy system, chatsystem are all here!